You are here: Home » Organic fruits and veggies!! For the past couple months I’ve been getting organic fruits and veggies from a buying club/co-op. The company is called Annie’s Buying Club and it’s awesome!! 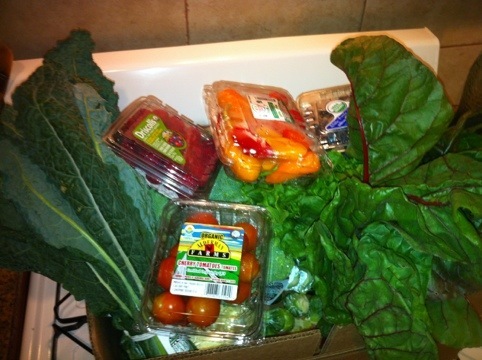 I pick up my share every two weeks and it only costs $35–way less than buying organic at the grocery stores! You have the option of getting a whole share (usually for families) or a half share (for 1-2 people) and you choose the frequency of your pick ups. They also have different types of shares. For example, I started off with the half share but found it to be too many fruits for me, so I switched to the veggie/berry share and now I get more veggies and just berries, which is perfect! Each week the share changes so you’re always receiving new stuff. You can go on the website and see what will be in next week’s share so you can start planning your meals. I also like the buying club because it forces me to eat certain veggies that I normally wouldn’t buy. It’s exciting to find new recipes and learn how to prepare things I normally wouldn’t make. I highly recommend it, check it out!! Here’s a pic of my share that I received yesterday. It included kale, Swiss chard, brussels sprouts, cherry tomatoes, sweet peppers, raspberries, broccoli, blueberries, green leaf lettuce, zucchini, and a couple other things I can’t remember right now…..
Glad you enjoyed it!! Hope you continue to read! Yum organic is always best 🙂 I would love to get a share but unfortunately it looks like there aren’t any where I am. Aw that’s too bad. It’s such a great deal, I was paying a fortune at the grocery store until I found this. Maybe there’s some sort of service like this where you live? I think they have it all over Florida, you might want to check it out. It’s worth it! !